I watched a movie recently, it was centred on a lady who became desperate to be in a relationship because most of her friends were in happy relationships and she desired to have the same. This led her into thinking that she was in a relationship with a guy whom she had known for a while. Interestingly, the guy never asked her out but they spent a lot of time together causing her to believe that he was involved with her romantically. She dedicated herself towards serving the man, washing his clothes, cleaning up after him and all other things she convinced herself she had to do only to discover that he had a fiancée all along. She was heartbroken and insisted that the man deceived her. While I understood her outrage over being exploited, I couldn’t ignore the fact that she set herself up for heartbreak. To be fair to her, she is one of the many that make the mistake of not defining their relationships. It is not all the time that a man that is interested in a woman tells the woman of his intention of starting a relationship, there are times the relationship blossoms from platonic to a more serious one. The line can also become blurry in several other instances. The right thing to do is to have a ‘sit down’ with the other person and discuss the situation. If one finds that one isn’t sure of another person’s intention, it will save a lot of regret and awkwardness if you ask/talk about it. Courting someone is a serious business and it should not be assumed. You always have to make sure that you are on the same page with the person you are with. 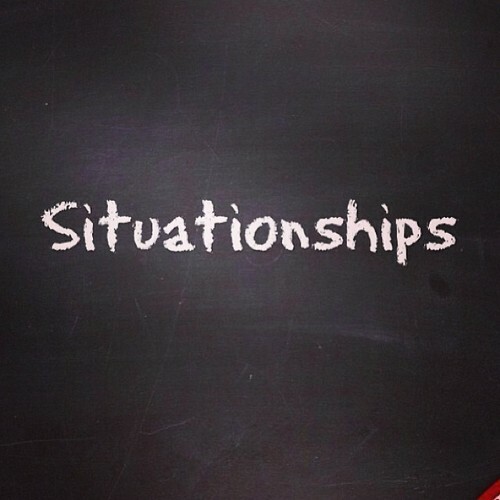 Don’t get trapped in a situationship. Another thing that was obvious from the movie that I also think resonates with the real world was the desperation of the girl to want to be in a relationship without setting any form of standard. She was ready to go with the flow thinking she could earn the man’s love by being his housekeeper, laundryman, cook and all other things that were unrelatable to whether the man loves her or not. Unknowingly, she threw herself at the mercy of the man . I have male friends that tell me that a desperate woman makes them uncomfortable. She was acting like her only essence in life is to be in a relationship with the man and this is a very wrong approach. Even ladies don’t appreciate men that act too desperate around them. The bottom line is you need to have some self-respect. Also, there are times, we find ourselves unconsciously thinking our true happiness can only be achieved through being in a relationship. Sadly, the society also plays a big role by subliminally making us feel uncomfortable with being single. From the overbooked wedding weekends and prodding family and friends to adverts on the TV offering a discount if one buys in twos, it feels like the only way one can truly be happy is when one is in a relationship. This notion that staying single is some kind of plague drive many people into getting stuck in unflattering situations. Love is great and beautiful when the one we love loves us back. It also happens differently for all of us and could be a huge gamble. Sometimes we are lucky in love and other times the story doesn’t have the kind of happily ever after we pictured. This could be for many reasons that are not under our control. You need to find yourself and be happy with yourself outside a relationship. Who you meet or get married to should complement you. Don't be afraid to ask questions, your time and life should mean a lot to you.